Now that we have a fair bit of familiarity with Walopus Drum Wrap, it’s about time for an in-depth, detailed Walopus Drum Wrap Review. Walopus currently have five categories of wrap; Tru-Sparkle, Reflusions, Spectra-Sparkle, Altered States and Wood Grain. 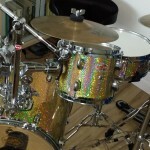 here at CompactDrums.com we’ve already had a chance to use the Spectra-Sparkle “Champagne” for our “DIY Nano Bop Drum Kit“, Spectra-Sparkle “Pacific Blue” for our Drum Wrap Instructions and Reflusions “Blue Glacier Pearl” for our “DIY Pico Bop Drum Kit”. Writing the instructions also gave us an opportunity to try out all three thickness options offered by Walopus. To ensure we provide you with the best information possible we also obtained samples for the finishes we haven’t used yet. 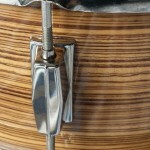 According to Walopus there are more finish options in the works. They should have at least another ten before the end of the year. Our first impression of Walopus wrap was with the “Spectra-Sparkle Champagne”. Walopus’ website is full of verbiage along the lines of “Sparkliest”, “Gleaming”, “Glorious” and other descriptions of glossiness. In all honesty, none of these descriptions really provide a full representation of just how gleaming, glossy and sparkly the “Spectra-Sparkle Champagne” really is. I also have not yet been able to capture the full effect of this wrap on picture. It has a depth, shiny gloss level and sparkle that just has to be seen “live” to fully comprehend. Maybe a pro photographer could do better than myself though. Actually all the wraps we’ve looked at from Walopus look a lot better in person. 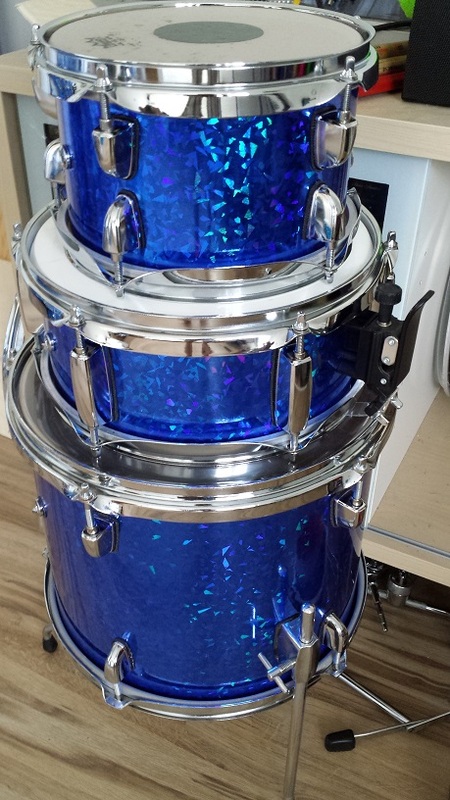 Some of them like the “Blue Glacier Pearl” on our Pico Bop kit have a bit of a dullness in the pictures, while in “real life” they’re glossy and deep like the surface of perfectly still water. the only exception is the really thin wrap intended for applying over top of existing wrap. It’s still marvellously gleaming, just not to the same extent as the “Standard” and “Thick” varieties. Not surprising since the thickness of the clear top layer on the thicker varieties exceeds the entire thickness of the “Ultra-Thin” variety. 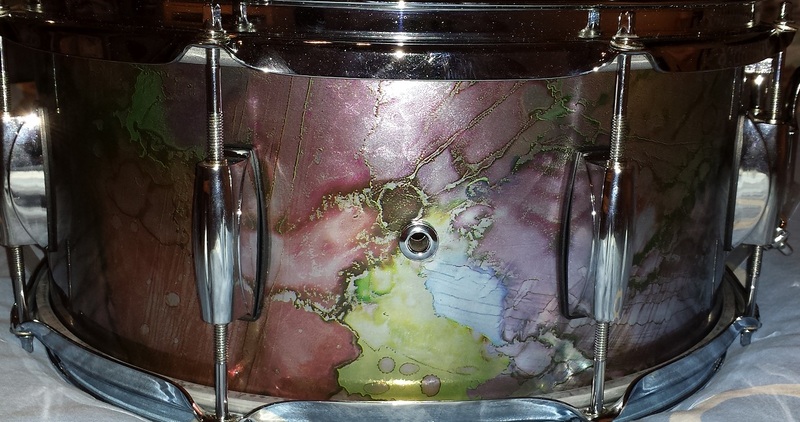 Walopus “Thick” drum wrap is indeed quite hefty. 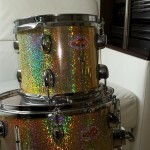 At 35 mil it’s comparable to traditional glass glitter wraps. 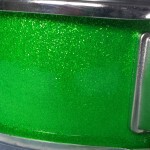 However it’s not brittle and while fairly stiff, not nearly as stiff as those aforementioned glass glitter wraps. 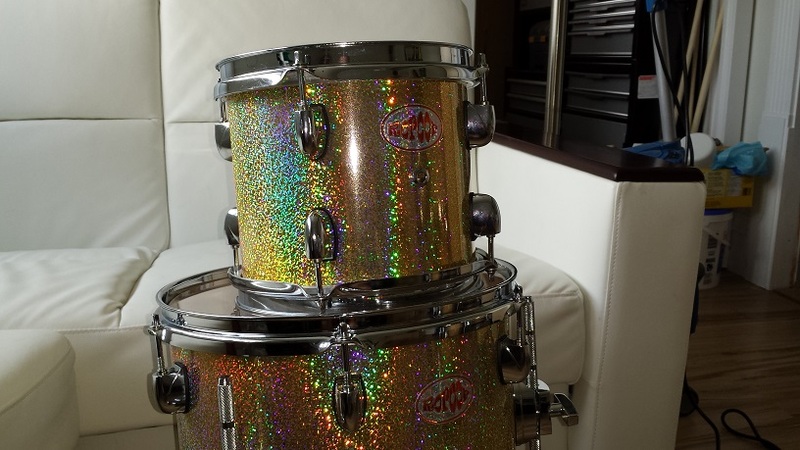 I wouldn’t hesitate to wrap it around a 6″ tom. The “Standard” variety is at 20 mil about the same thickness as most common wraps. It conforms quite easily and is very pliable to work with. Although the “Ultra-Thin” is the only option that could be applied over an existing wrap, I personally wouldn’t recommend that idea at all. Except possibly if you’re only doing it to protect an existing wrap while doing extensive gigging and you have a collector’s grade kit. All three grades are equally durable, are all priced the same and oddly enough put up an equal amount of resistance to cutting. They can all be cut with regular scissors but not without a wee bit of effort. 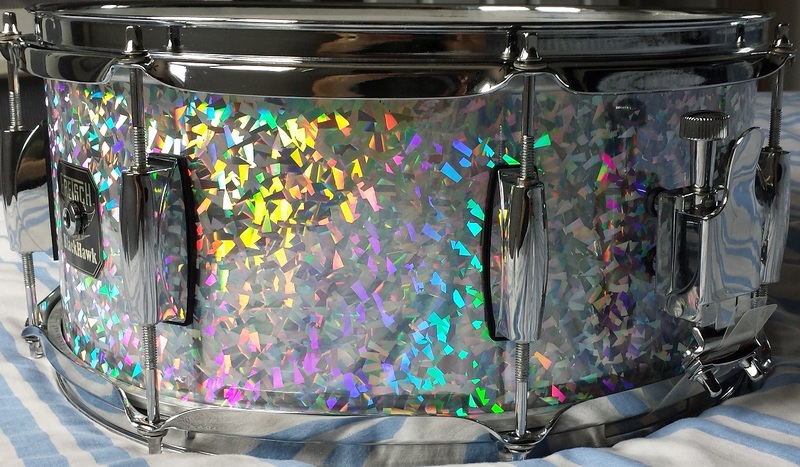 There are some additional notes on durability in our Drum Wrap Source Guide. Visually they are all stunning. 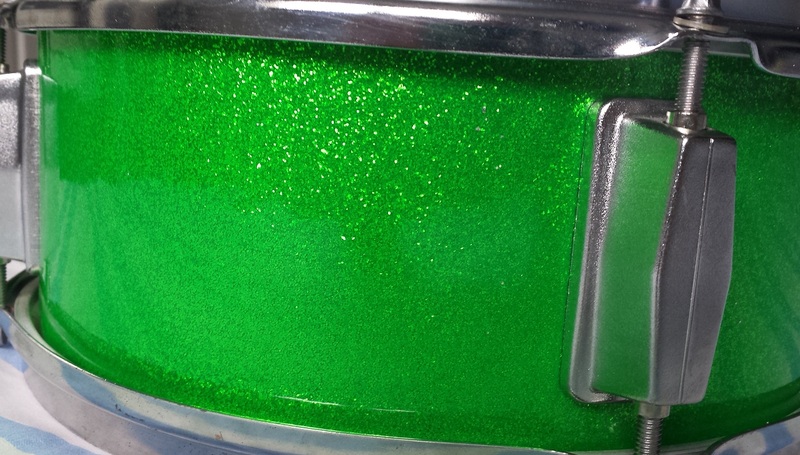 The “Tru-Sparkle” designs have actual sparkle particles embedded in the plastic concoction that makes up the wrap, while the “Spectra-Sparkle” has some kind of simulated sparkle “stuff” that has a “prism”-type effect in certain light angles. Lighter colours like the silver and champagne offer substantially more prism effect than the more saturated blue and red. The “Reflusions” line has a strange depth effect that simulates a visual depth that seems to far exceed the depth of the material. It also looks different from different angles giving it a three-dimensional illusion that of course play part in the perceived depth. While the “Wood Grain” in comparison seems a bit boring, they also have an uncanny depth to them and a very natural wood grain. 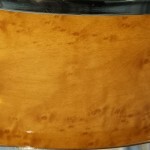 The Birds Eye Maple in particular looks just like the real thing with some 60 or so coats of wet sanded clear on top. The “Altered States” line is the most unique and unusual. 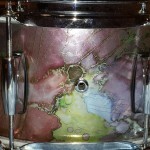 It has the same depth and gloss but with some eye-popping and rather psychedelic designs under the gleaming clear layer. 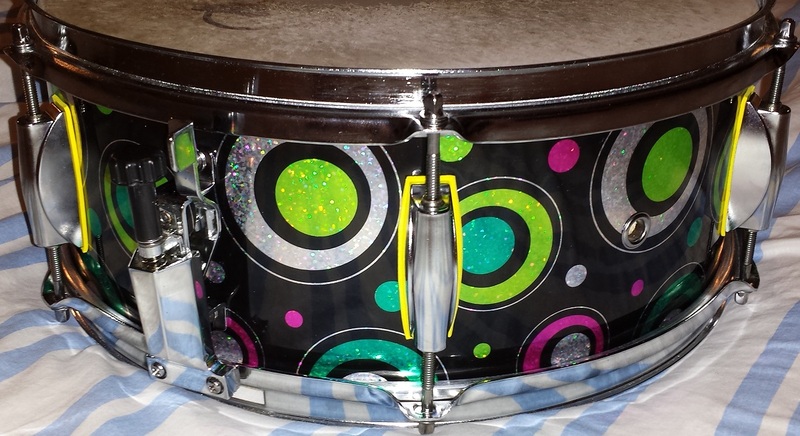 Walopus Drum Wrap is delivered with a minimum of 1″ overlap and of oversized depth. The oversized depth is to allow for your choice of installation method and to accommodate for slight variations in shell depth between manufacturer’s. The added flexibility is to me a big plus, but of course it comes with the downside that you will have to cut one edge yourself. Luckily this is easily done with regular scissors. 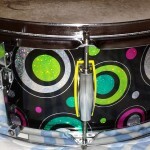 These are some of my personal favourites from Walopus Drum Wrap. 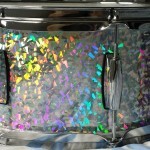 Walopus Drum Wrap has become our new favourite here at CompactDrums.com. The multiple Pros include; Stunning Finish, Very good resistance to gouging and scratching, Unusual and traditional designs, Very competitive price, and Flexible, easy installation. The Cons are limited to the somewhat narrow selection. However this is something that Walopus promises to increase significantly in the near future. I’m looking forward to seeing what they may come up with. 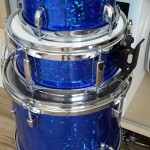 In this Walopus Drum Wrap Review we award 5 out of 5 stars without hesitation.